The picture shows attached in place, the Evaporator Fan frame assembly is Snap locked in place. The bundle of wire shown is the wire harness before the wire lead is slid through the drain tube. The steel frame is power coated, white in color. The outer steel flange side mounting legs (right and left) are attached to an evaporator fin with very aggressive Velcro 2 surface locking to the outer surface. Of course with this style of attachment allows the fan frame to be removable as well. The Left and Right Flanges are pressed in place to lock the 2 side frame holding flanges in place before the fan frame is snapped ON. No Drilling at any time for any mounting. The Fan frame is now snapped in place after the side flanges are attached. The out frame is removable for cleaning if needed. We use Velcro since it never wears out and not effected by cold or age. The Frame is attached to the flanges at a preset angle downward to circulate the inside shelf air through the fins pushing cold of the evaporator fins through out the interior of the refrigerator. another feature is the LED light which can be ON all the time or turned ON when needed rather any of the fans are ON or not. The systems is protected by a front mounted fuse holder with fuse and screws on cap. The White Powder coated Frame size is 13 wide by 4 5/16 height and around 5/8 inch thickness. This version will fit the larger Dometic side by side refrigerators also. 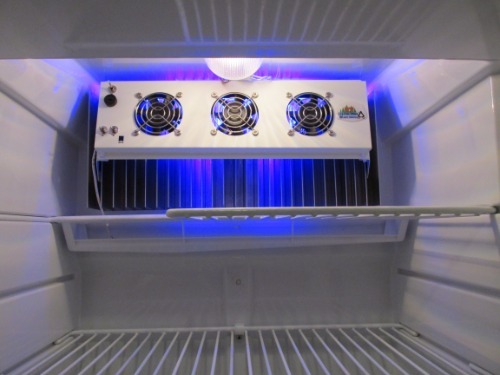 You need our 13 inch wide model for some of the smaller single door refrigerators. With the small size and the way it's attached to the front of the evaporator it will not take up space from your food zone shelf. Fan are very quite running, unable to hear them running. This design features means your interior light does not have to be moved, nor do you need to purchase different models for different Brand refrigerators. According to some competition found on the web you need to remove and remount interior light or on some models you must install an air baffle to direct air through the fins, or on some you need to relocate the thermostat, and so on. Our unit is set at an angle to the fins, no moving of any thermostat, no moving of any interior light. no adding an air flow diverted to make the fans blow through the fins, ours have individual toggle switches for LED lights and/or Fans from 1 to 3 fans running at one time. Competitors turn ON unit all fans run and light ON all the time no way to controls each. The wiring harness lead would slide through the Drain tube to make the DC connection at the refrigerator PC Board or incoming DC power. We did not design this fan to use the interior light for the DC power, since most of the newer refrigerator coming out do not have an interior light with continuous DC voltage present when door is closed. In case some customers need a unit wider we do have a wider version, a 15 1/2 inch wide unit, with all the same features as this unit. This is a special introduction price for this new design and new features. With our very high sell volume of the small 2 fan units we can save you over a $100 from what a competitor sells their unit for with out all the features we have a standard equipment. This was a very straight install and looks great. It is replacing 2 D cell battery units and takes up less space. My Dometic fridge has a slight taper to it and because of that the unit was not a perfect fit. This is obviously not the fault of this manufacturer. I was able to do an easy modification to the width of the unit. The only hard part was feeding the wire out through the drainage tube. I resolved it by pouring a small amount of water down the drain and then the wire slid through. I will update this review or add another after we take our first road trip with it. Norcold 1200LR Cooling Unit PKG w/2 AC elements, 2 Fans w/fan switch pkg- built by the Amish. 1200LR Norcold Brand-New Cooling Unit, built by the Amish.